App Port Sample - TOPS Infosolutions Pvt. Ltd.
What is Shishar all about? If you like whirling around flea markets and you are looking to boost sales on weekends or browsing hours through classifieds, you’ll love Shishar. 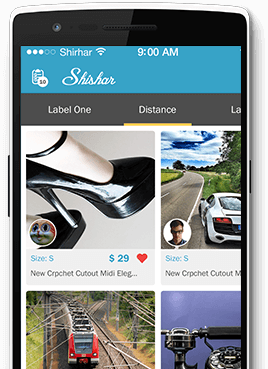 With Shishar you would find the most beautiful things around and enables to sell your things quickly to other people around you. With classifieds categories covering cars, electronics, furniture, free stuff, housing, jobs and more. Buy and sell gives you the power to browse, buy, list and sell in just few taps.